"When Revenge is personal, justice can be brutal." Simon Ballister (Seagal) is distraught since the shooting death of his son. His son was a cop in the ‘hood, so naturally, Ballister goes to said ‘hood and rents a downtrodden apartment so he can live amongst the urban folk, aka racial and ethnic minorities. He then proceeds to do more damage to Blacks and Latinos than any racist skinhead could ever dream to. In his quest for revenge, he discovers that crime lord/drug dealer/Scarface (1983) enthusiast (duh), Armand Tucker (Griffin) might be the key. After seeking help from his buddy Chivo (Trejo), Ballister goes after Tucker in a no-holds-barred quest for URBAN JUSTICE. This Seagal outing was a lot of fun. Make sure you watch it in a group like we did for best results. You know when the cynical Seagal is playing the Urban Cowboy and speaking in “Ebonics” that you’re in for a raucous good time. For the movie as a whole, try to imagine a poor man’s Dark Blue (2002) or Street Kings (2008). 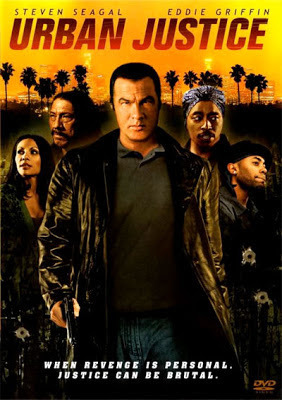 Trying to capitalize on those great James Ellroy-penned tales but with Seagal in the lead is a guarantee for pure silliness, and Urban Justice doesn’t disappoint in that department. 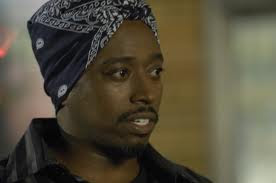 And while Jade Yorker deserves special merit as Gary in this film, despite what you think of Seagal, and despite what you think of Urban Justice in particular, Eddie Griffin rules this movie. He has a lot of energy and funny dialogue, and he seems to be giving his all. So top marks go to Mr. Griffin, whose performance acts as a motor that propels the whole movie along. By comparison, the sluggish Seagal is mainly dead weight (write your own joke). The movie could have used much more Danny Trejo as well, as his screen time is pretty limited. He and Seagal don’t even fight, they just talk for a few minutes. A definite wasted opportunity there. On the technical side, the squibs used in the gunshot scenes are pretty over the top...but then again, we’ve never seen someone be shot in real life, so for all we know, it could look like an entire pitcher of Kool-aid explodes out of your back. We just don’t know. We’re trusting director FauntLeRoy for our ballistic information here. Mainly because we only trust people with three capital letters in their last name. Plus there are way too many extreme close-ups of Seagal’s face here. Not just close-ups. EXTREME close-ups where his giant mug fills the entirety of your screen. Whether he demands this, or FauntLeRoy thinks it’s integral to the storytelling, we don’t know. But the natural human instinct is to yell “too close! Too close!” Honestly, no one needs to get that close to Seagal. 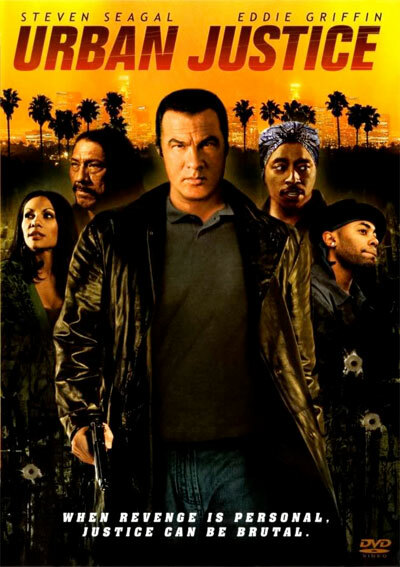 So if you’ve ever wanted to see Steven Seagal in the ghet-to (to use the Bill Cosby pronunciation) and communicating with his fellow homies on “their level” (predating Steven Seagal: Lawman), this is the movie for you. Also check out write-ups by our buddies, DTVC and The Video Vacuum! Hell yes, apart from Machete this is probably the only other Seagal film that's been worth watching from the last decade. The explosive squibs are amazingly bloody. 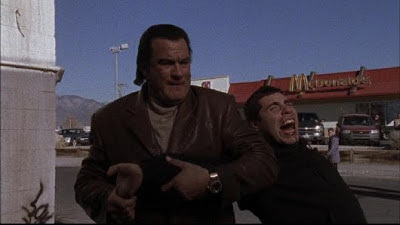 Seagal seems to doing most of his own fights (and dialogue). And Eddie Griffin is very amusing. 100% agree with your points. Loved the squibs...all action movies should be bloody like that. Griffin stole the movie. Also when we watched it with some of our buddies, it was a huge hit! This was one of the best Seagal movies since he became the spokesman for Weight Gain 3000. In Europe, the movie is known as Renegade Justice. Urban still means an area of the city here, not a ghet-to. Haha, nice South Park reference. That is interesting about the title change. So far, this is one Seagal's best Direct to vids...it's going to be hard to top. Great one this, also called Renegade Justice out here in Australia. Definitely the best DTV film of his so far. It really can't be beat. Seagal and Griffin are at their best. I enjoyed this one. A simple story and regular (and brutal) fights. It's basically all we want from Seagal (that and delivering his own dialogue). Can't agree more. If Seagal can just stay on this path, there's no reason to make fun of him. Thanks for the shout out. I have to say that for me, Pistol Whipped edges this one out as Seagal's best DTV effort, but this is a big step-up from his usual stuff. No problem. We didn't like Pistol Whipped...except that it was shot in CT. Haha.